For the Love of Lore! 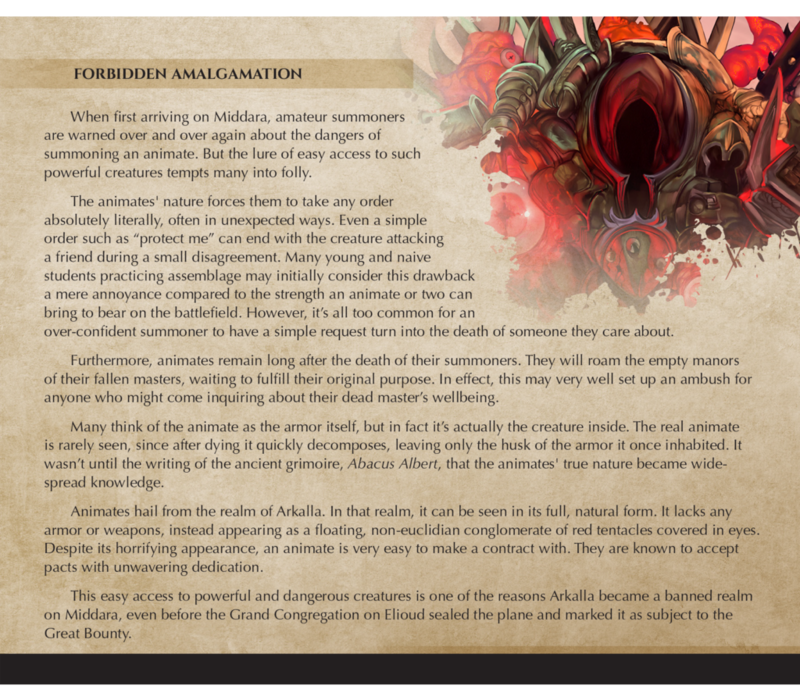 We wanted to start setting precedent for semi-regular updates again and we thought a good starting point would be to talk about what we’ve done with the backs of our Adventurer and Command cards. Since our Badman Variant has been temporarily sequestered to the grim darkness of the future, we’ve replaced the backs of our cards with sweet, sweet, lore. While some of you will lament the delay of our Badman Variant, do not fret! We still plan on making that happen. Sure, we’ve had our struggles balancing and making the Badman Variant fun, but here at Succubus, we feel very strongly that making this variant work is possible with a little hard work. On the bright side, removing the Badman rules from the back of these cards has made sorting through our game and seraching for cards in question much easier. 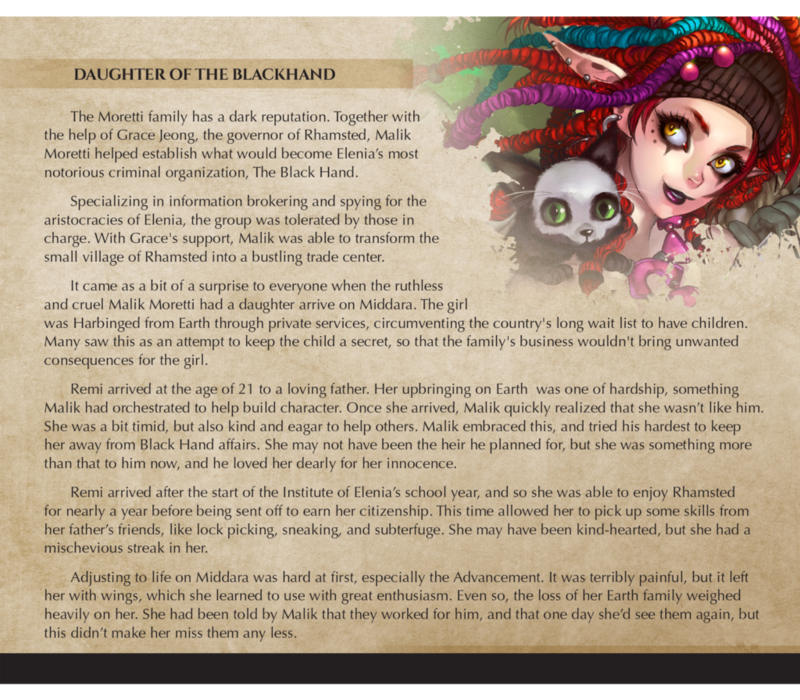 We’re a huge fan of lore, and being able to include it on all of our Adventurer and Command cards has given us the opportunity to go all out when building the Middara milieu. All of our Adventurer Cards, Command Cards, and Espers will have lore written on their backs. 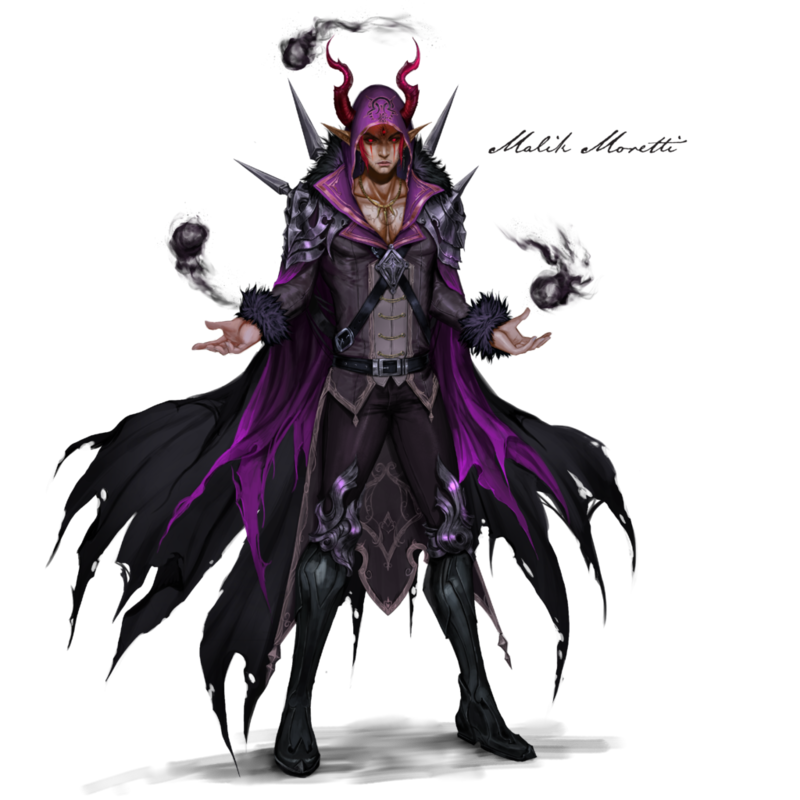 The purpose of this lore is to help expand our setting and get a better feel of our world. As more content is released in the future, we’ll keep updating and supporting the ideas found within the fiction. While there is no specific style for the way our fiction is written (many of these were written by different people) a lot of the lore is flash fiction that will hopefully tell you a little bit about the monster, Esper, or the Adventurer your looking at. 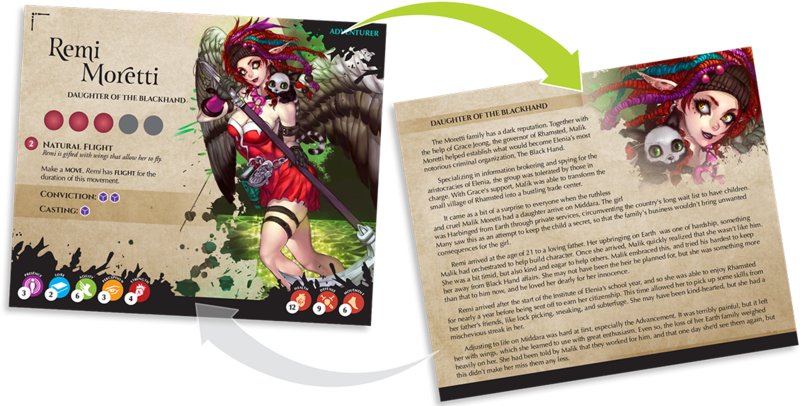 Adventurer cards tend to be info dumps to help our players quickly get acquainted with the world around the Adventurer they’ve chosen. For example, Remi’s story talks a lot about her father, Malik. He’s a bit of a scoundrel in the country that Middara: Unintentional Malum takes place in. However, despite looking like a villain, Remi has a great relationship with him, and the two get along swimmingly. When important characters appear in our adventure books for the first time, we’ll usually include an image depicting them. Above is an example of Malik, and when our characters interact with them the first time during an adventure, we’ll use this image to help players remember who he is, and perhaps give a nod that he’s an important character in our world. 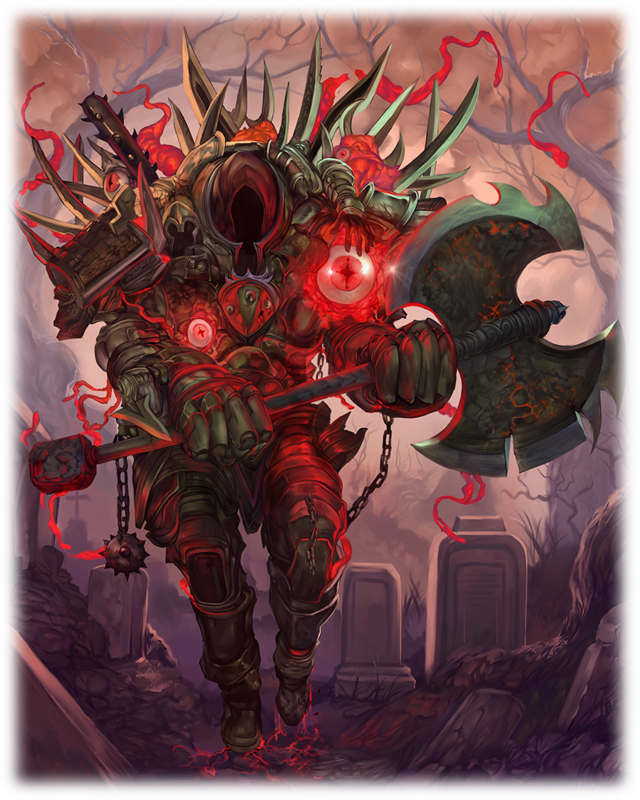 While these character may, or may not take a center role in this story, we hope that the fiction on the back of cards, coupled with their artwork appearing will help player become better acquainted with the narrative idea that Remi already has a relationship with this man and he is someone we will continue to reference as our game expands. We have strange and wild artwork. In fact, we purposely tell the artists we work with to portray characters and monsters as weird as they want/can. We feel that adding context to our combatants through our fiction is half of the fun. This means that our combatant fiction is usually written from an academic point of view, as if the creature is being documented by some historian. While this isn’t always the case, we do use it a rule of thumb. Click for zoom and clarity! In addition, we typically use the lore on the back of cards to lay context for things that players might encounter as they play our game. 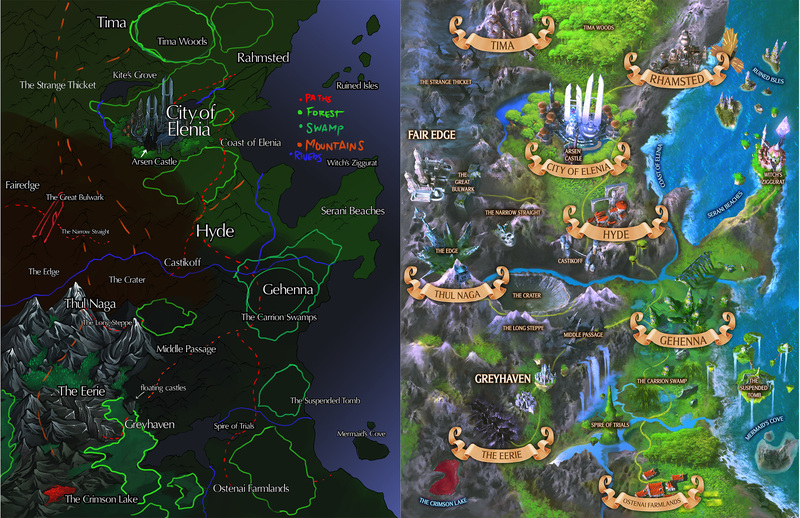 In the above example, we talk a bit about the realm of Arkalla. This realm plays an important role in the narrative in Unintentional Malum, so we establish context through the fiction on many of our cards. There are two different cards that represent Espers. Intelligent Espers are Espers that players fight and are represented as a generic Esper of the given type. 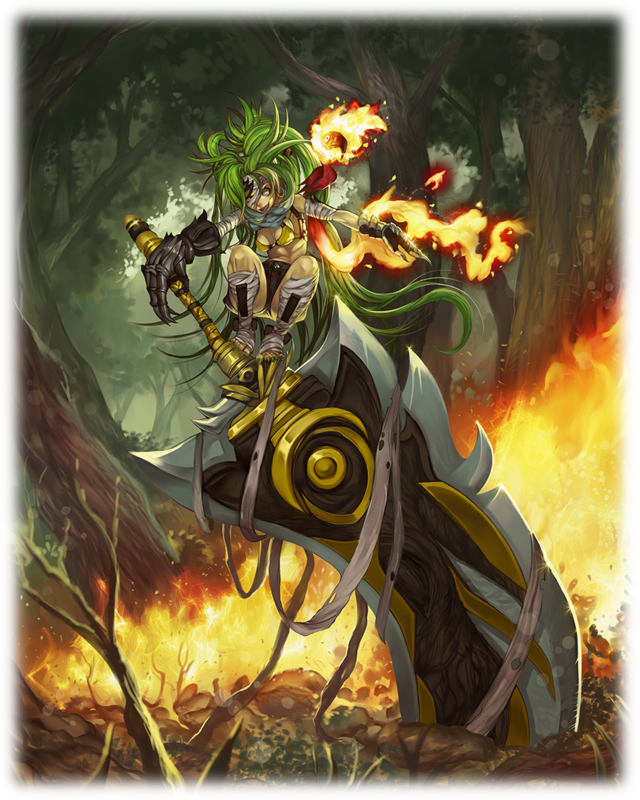 For Example, Spirit Blade. Command Espers represent Espers that players have personally summoned to fight along side them. In the above example, you can see the two side by side. While both are Spirit Blades thematically, one is named and represents the Esper that the players control. The fiction written for Intelligent Espers is similar to that of combatants and is written from an academic perspective. 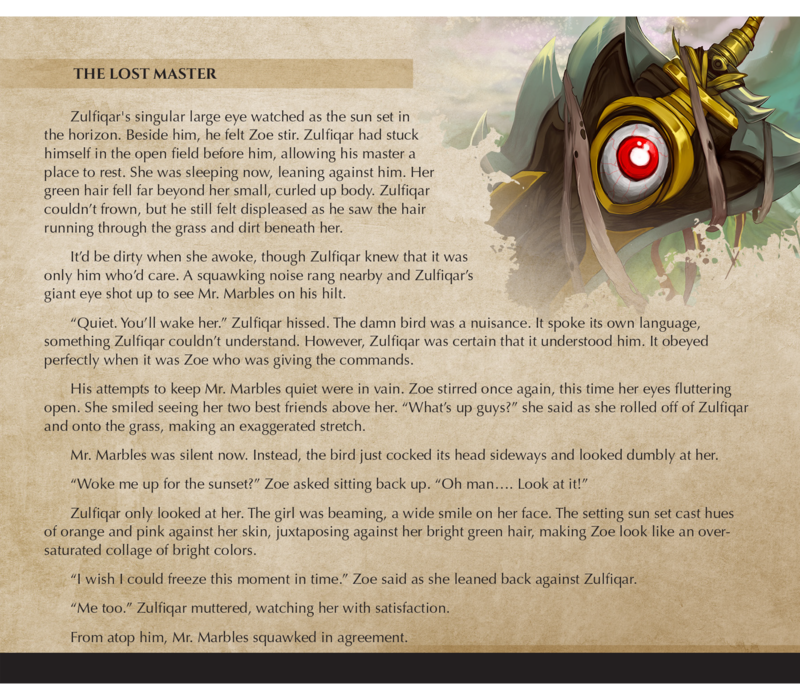 This will help provide players with context when reading the lore on the backs of their Command Esper counterparts. The Command Esper lore reads more like flash fiction. It might tell players about the Esper’s past, or even just explain a bit about who they are. 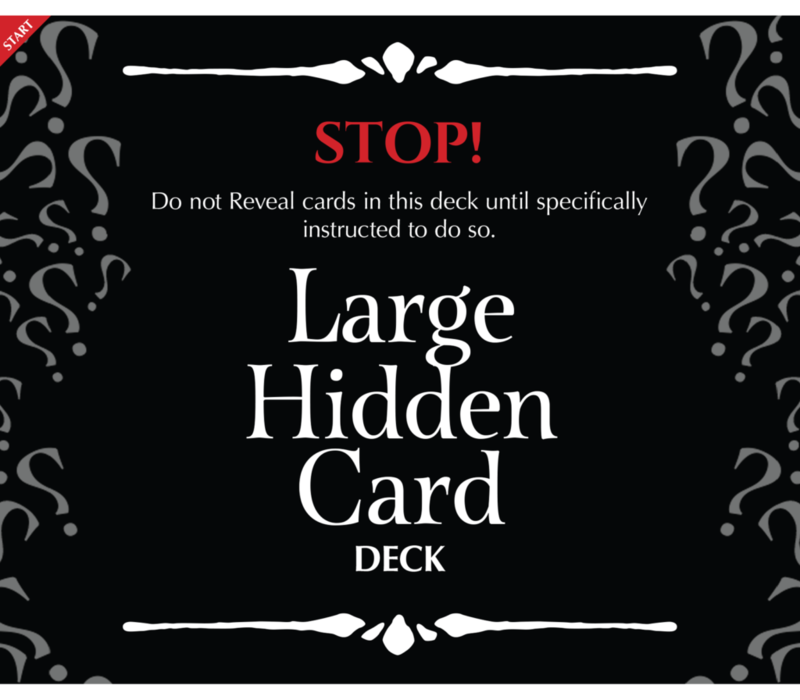 Included in Middara: Unintentional Malum are over 70 Hidden Cards. 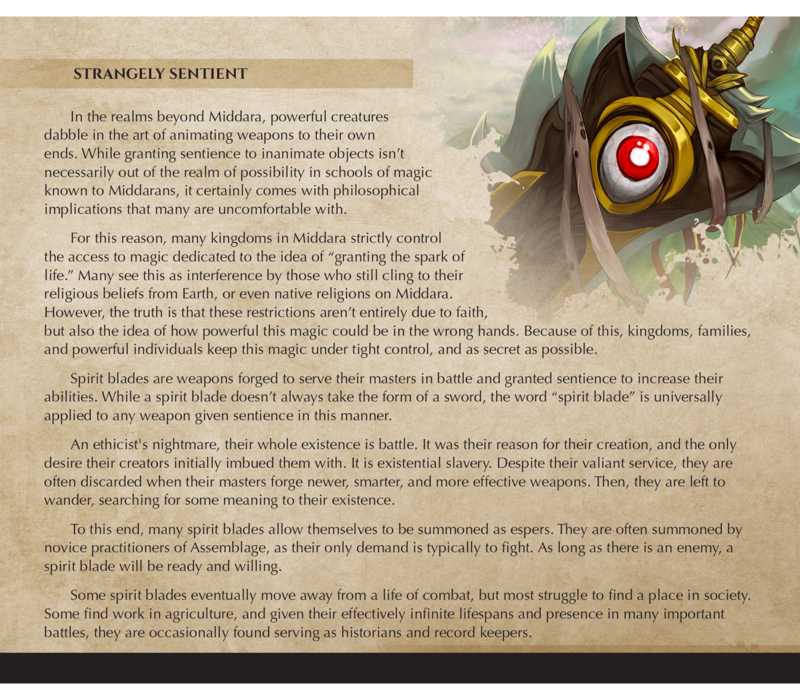 These serve as one of Middara’s legacy mechanics and also include unique fiction on them. Most of these are written as flash fiction to better expand upon who (or what) the Adventurer, Combatants, or Esper is. We’re not about to spoil any secrets after 2 years of development so we’ve decided to not show off any of these cards! Lastly, we wanted to let you guys know that we’ve been working internally to come up with a fun set of updates that will help flesh our world out. We’re calling these updates Middara Milieu, and we intend on releasing them slowly but steadily. Also, some backers have asked, and we are arranging a playtest in the near future to be filmed and posted on an update so look forward to that! Thanks for checking out our update guys! We’re excited for what’s to come!